Pravin Gandhi College of Law is an institution under the aegis of the Shri Vile Parle Kelavani Mandal and affiliated to the University of Mumbai, which is organizing a One day National Conference on Entertainment Law Jurisprudence on Thursday, April 12, 2018 in the college premises. 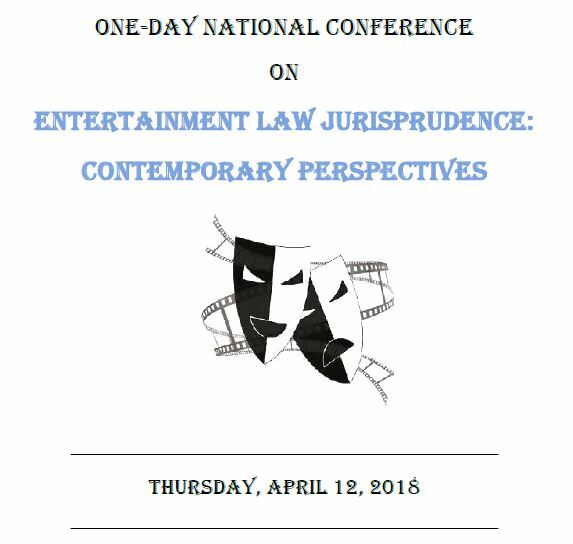 A platform to explore the complex legal principles emanating from the diversified socio-legal-political-cultural matrix of entertainment law both in the domestic and international domain shall be provided in the conference. An opportunity to compare, critique and discuss the law regimes around entertainment in its myriad forms and to examine the intertwined threads of State control, statutory obligations and human rights issues that cocoon entertainment laws shall be furnished. The above objectives are sought to be achieved by having panel deliberations of eminent persons in the field and discussions followed by paper presentations. Selected research papers will be published in an ISBN publication. This list is indicative and papers on allied topics are welcome. Original, unpublished papers must be submitted that may be on empirical, doctrinal, theoretical, or case study basis. Every entry has to be accompanied with a 300 word abstract and a separate cover page with: Title of the paper, Name of the author/ co-author(s), designation, institution, address, contact number and email id. Word limits: 3000 for short articles; 6000 for full length papers. Citation style: footnotes, ILI, please click on link to access the guide given here. All Papers will be reviewed by a panel of eminent experts and selected entries will be published in a book with an ISBN number. In case of non-selection of paper the registration fee is NON-REFUNDABLE. Participants whose paper is not selected for publication are eligible for attending the conference as well as paper presentation. TA/DA and accommodation will not be provided by organising institution. The conference schedule will be e-mailed by the first week of April, 2018. DD/Pay Order in favour of Pravin Gandhi College of Law payable at Mumbai. Juhu Vile Parle Branch, Mumbai. Previous ArticleJustice well served: Bombay High Court vindicates a woman of insinuating allegations on her character!